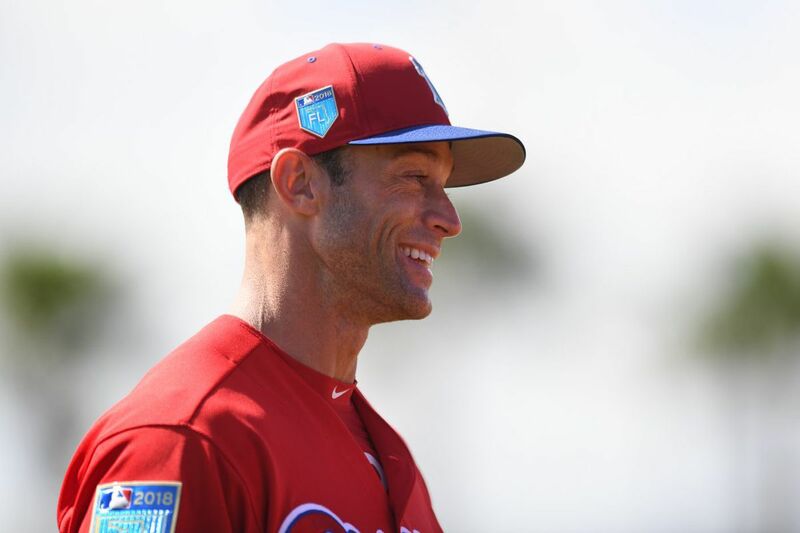 Phillies Manager, Gabe Kapler smiles during spring training workouts at Spectrum Field, in Clearwater Florida. Wednesday, Feb. 21, 2018. SARASOTA, Fla. — Gabe Kapler pulled Carlos Santana aside before Sunday night's game, just after the manager had learned that the Phillies were making progress toward signing Jake Arrieta. Kapler wanted to tell Santana — whom the team signed in December to a three-year, $60 million deal — that the Phillies had made another splash. "He was very happy, he was smiling," Santana said. The Phillies, according to a source, have an agreement with Arrieta on a three-year, $75 million deal. The Phillies played Sunday night — losing to the Baltimore Orioles, 4-0 — but the focus was on Arrieta, who will take his physical this week before joining the team. "Look, if Jake Arrieta is a Phillie, of course I'm going to be exceptionally excited," Kapler said. "Love everything about the guy. The crossfire delivery creates all sorts of deception. We all know about the success that he had in Chicago and previously. It would be awesome if Jake ends up in Philly. … Speaking hypothetically, he's a tremendous leader. So many people have said nice things about him. Obviously the track record of success, I don't want to curb any enthusiasm here. He would be an incredible boost to our rotation. I think he would be a great leader in the clubhouse. I think our players would follow his lead in many ways and lean on his experience." Signing Arrieta does not make the Phillies an immediate contender. But his arrival will move the needle. The Phillies, after a winter where they spent $169 million on free agents, will enter the season with some buzz. "I don't know if that changes our ultimate goal. I think it's always been the same, but if you get a chance to add someone like this, it's only going to make us better," Rhys Hoskins said. "Obviously it's exciting, very, very exciting. I'm glad I don't have to face him. But yeah, I think it's nearer to us than most people think." Nick Pivetta, Sunday night's starter, said he did not hear of the Arrieta news until he had completed his 4 2/3 innings. The right-hander entered spring training as part of a young rotation. A veteran presence — and a reliable arm — was needed. "When you get a guy like that into any clubhouse, even bringing in a guy like Santana, just brings a leadership role to those rookies, me being one of them," Pivetta said. "It's just going get a little more up with the guys in the clubhouse. I think it's a smart move." Santana faced Arrieta in the 2016 World Series when Santana was a Cleveland Indian. He went 0 for 6 with a pair of strikeouts. He saw a glimpse of what Arrieta could do in winning both of his starts en route to the Cubs' first World Series title in 108 years. Two years later, they meet again. "I feel great, I feel happy for him, happy for me and my team," Santana said. "I think it's great. He'll help a lot, so I'm happy that we have a very good player." Scott Kingery singled again and is batting .391 this spring. …Edubray Ramos retired both batters he faced…The Phillies travel to Disney World Monday night to play the Braves. Zach Eflin will pitch.